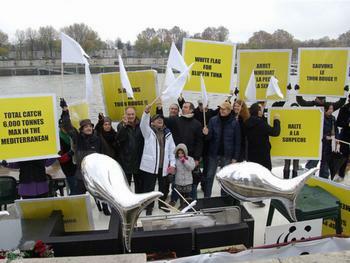 PARIS, France, November 27, 2010 (ENS) – Government delegates from 48 fishing nations today failed to protect the spawning grounds of the vanishing Atlantic bluefin tuna, either in the Gulf of Mexico or the Mediterranean, although they did approve some protections for whitetip and hammerhead sharks. 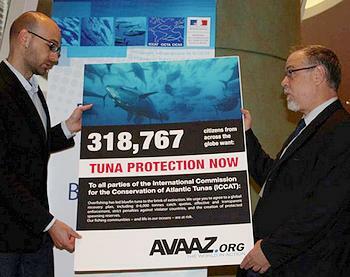 Gathering in Paris for the annual meeting of the International Commission for the Conservation of Atlantic Tunas, ICCAT, delegates emerged from days of closed-door negotiations with a decision to drop the 2011 bluefin fishing quota by just 600 metric tonnes, from 13,500 to 12,900 tonnes for the Mediterranean fishery and 1,750 tonnes for the Gulf of Mexico. Conservation groups, ICCAT’s own scientists, the European Union and the United States had been urging a 2011 quota of 6,000 tonnes for the Mediterranean bluefin population to enable recovery of the overexploited fish stocks. They say the ICCAT decision does little to help the species recover, despite documented evidence of a multi-billion black market in bluefin tuna. Dr. Susan Lieberman, director of international policy for the Pew Environment Group, said the governments are “incapable” of managing the large tuna, whose soft, red flesh is highly prized in sushi restaurants around the world. “Greed and mismanagement have taken priority over sustainability and common sense at this ICCAT meeting when it comes to Atlantic bluefin. This measly quota reduction is insufficient to ensure the recovery of bluefin tuna in the Mediterranean Sea,” said Dr. Sergi Tudela, head of WWF Mediterrean’s Fisheries Programme. The IUCN Red List of Threatened Species lists the bluefin tuna, Thunnus thynnus, as Data Deficient, saying population numbers have not been assessed since 1996. Atlantic bluefin have become extinct in the Black Sea and Caspian Sea. “Bluefin tuna will be wiped out unless drastic action is taken to stop overfishing at the world summit going on right now. Without these magnificent fish, oceanic ecosystems could collapse,” warned the international nonprofit Avaaz, which submitted a petition signed by more than 319,000 people to European Union negotiators at ICCAT, urging bluefin protection. A week ahead of the meeting, EU member states agreed to a negotiating mandate at ICCAT which was not based on the recommendation of the European Commission. At the meeting, the EU tabled proposals for two new recommendations prohibiting fishing for porbeagle sharks, which have declined by half in much of the Atlantic, as well as thresher and hammerhead sharks. Voting today, ICCAT members approved new protections for seven species of sharks: oceanic whitetip sharks and six types of hammerheads: great, scalloped, scoophead, smalleye, smooth and whitefin. 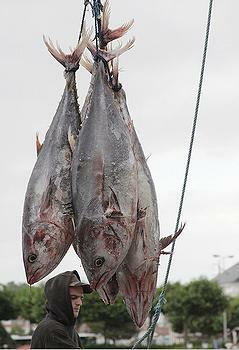 The fishing, retention and sale of these sharks will be banned. But Canada, which has a targeted porbeagle shark fishery, helped block that proposed ban. The EU also worked with the United States and other members of ICCAT on a third proposal which would set precautionary catch limits for shortfin mako sharks, but that proposal failed after Japan, South Korea and China all opposed shortfin mako quotas. A U.S. proposal to prohibit the removal of shark fins at sea, a practice known as shark-finning, failed on Japan’s objection. 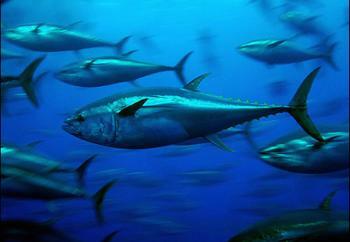 “The United States pushed hard for parties to adopt science-based management measures for bluefin tuna and other species, applying a precautionary approach where needed and taking into account impacts to the ecosystem,” said Jane Lubchenco, PhD, the U.S. under secretary for oceans and atmosphere and administrator of the National Oceanic and Atmospheric Administration, NOAA. “While we met with mixed success at this meeting, we will continue to push for sustainable management to support the long-term stability of jobs associated with the recreational and commercial fishing industries,” Lubchenco said. But conservation groups point to a huge black market in bluefin tuna uncovered by the International Consortium of Investigative Journalists, ICIJ, in a report resulting from a seven-month inquiry into ICCAT member nations’ management of bluefin stocks in the Mediterranean. The ICIJ revealed waste, fraud, and rampant mismanagement in the reporting of bluefin catch totals between 1998 and 2007. “Fishermen blatantly violated official quotas and engaged in an array of illegal practices, including misreporting catch size, hiring banned spotter planes, catching undersized fish, trading fishing quotas, and plundering tuna from North African waters where EU inspectors are refused entry,” the ICIJ reported. 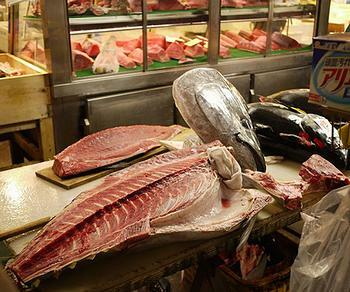 “A widespread, off-the-books trade in bluefin tuna has existed in Japan since at least the mid-1980s,” the report states. ICIJ obtained a confidential 2006 investigative report commissioned by Australia and Japan that exposed widespread overfishing and laundering into Japan of southern bluefin tuna, a sister species of the Atlantic bluefin tuna. Dr. Tudela of WWF Mediterrean’s Fisheries Programme said this year’s ICCAT meeting did nothing to remedy this situation.